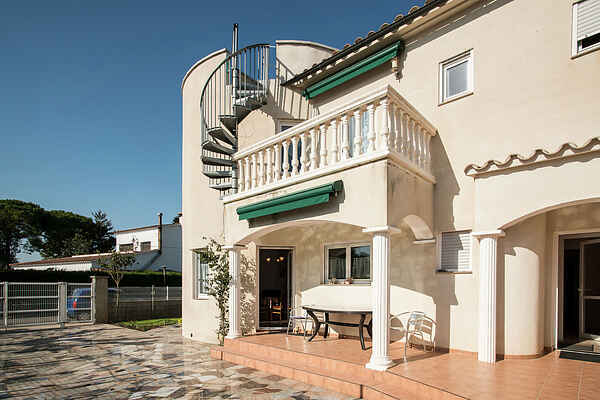 This holiday home is located in the urbanization of Bon Relax, close to the village and just 1.2 km from the beach. The house has two floors with five bedrooms in total (two downstairs and three upstairs) and accommodates up to ten people. You even have a private pool at your disposal, so you can take a dive at any moment of the day. The holiday home is located near Sant Pere Pescador. Each floor is a separate house with its own kitchen, living room, bathroom and bedrooms, the house can only be rent in total and not separately. Ideal to rent with several families. There are fully equipped kitchens, large dining tables, comfortable beds and... the pool beckons! And maybe the sea beckons even more! Delicious paddling and looking for shells or watching the sunset. Culture lovers can also have the time of their life on the Costa Brava. Pay a visit to Cadaques. This picturesque and elegant town is known for its artists such as Joan Miró, Pablo Picasso and Federico García Lorca. Salvador Dalí also had a villa just outside Cadaques in Portlligat. Also recommended: Girona. You probably won't know where to look first in this big city. Many alleys and streets have hidden gates with always something new to discover.